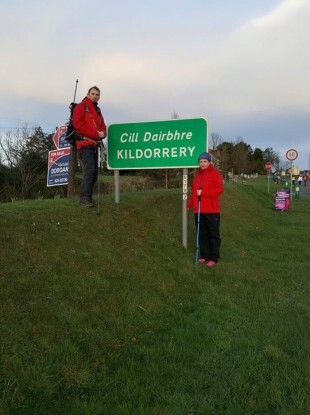 Vera Twomey is entering day two of the 260km protest walk. Vera Twomey on her walk with TD Gino Kenny. A DETERMINED MOTHER is walking from Cork to Dublin for a second time in a bid to get Health Minister Simon Harris to allow her daughter access medicinal cannabis. Vera Twomey yesterday began the 260km walk from her home to the Dáil as a protest against decisions to restrict her daughter Ava, who has rare form of epilepsy called Dravet’s syndrome, from accessing the drug. Vera has been in a number of meetings with Harris and has tried to get the Minister to allow Ava access cannabis-based medicine on compassionate grounds. Ava, who would have suffered dozens of seizures on a daily basis, has had access to CBD oil costing around €300 a month. Last week, Twomey released a harrowing video of Ava suffering a seizure to TV3 and, today, spoke to Ray D’Arcy on RTÉ radio following her meeting with Harris, where advocates Gino Kenny TD and Anne Rabbitte TD were also in attendance. Vera Twomey on the Road from Cork to Dublin to help her daughter Ava. Email “Mother on protest walk from Cork to Dublin for second time to get her child medicinal cannabis”. Feedback on “Mother on protest walk from Cork to Dublin for second time to get her child medicinal cannabis”.